Yuki in the beginning stages of the comic strip creation. At first glance, Yuki seems like a sweet, ordinary cat. But Yuki not only has a reputation for trouble, she is also the star of the Rogue Valley Messenger’s first, locally-created comic strip. As creator Tanya Reasor explained how the comic came to be, I realized that it’s really a story of how you deal with a cat who brings a combination of cuteness and destruction into your life. A sane person might give such a cat away—say, to a farm where it could become a barn cat and live out its life happily tormenting rodents—but Reasor’s quirky and creative side got the better of her. The beginning of Yuki’s life is the stuff of fairy, um, tails. Found sitting atop a fence post near fairgrounds where feral cats were known to wander, the tiny baby Yuki, was rescued by a kind woman who happened to be Reasor’s niece, Amie. She brought the baby kitty to Reasor, causing her to fall in love with the little bundle of fur and purr and give it a home. But things soon changed. It started with the flood of the century. The floors were covered in water and anything that had been on the ground was now soaking wet. How did this happen? Did a pipe burst? Was there a sudden rain and flash flood that had filled the house? No, this was the work of Yuki, that small fluffy kitten with paws that you’d swear had opposable thumbs. Yuki had learned to turn the water on. Jump up to the counter top and pull that little chrome lever toward you with your paw, and then you get a drink of water. It doesn’t matter that the human occupants of your home have given you a bowl of fresh water. Why drink from that when you can turn on the faucet and drink directly from it? It’s way more fun. Unfortunately, Yuki did not learn to turn the faucet off. And that’s how the flood happened. Coming home to her now soaked belongings, Reasor was confronted by a driveway and carport littered with items drying out. While she tried to wrap her head around the destruction wrought by the fluffy grey and white beast, Reasor’s husband explained the story he’d been able to piece together about the water faucet. Meanwhile, Yuki licked her paws, oblivious to the destruction. This was the moment when everything in Reasor’s life culminated in one purposeful event that would underscore what she should be doing. Yuki’s existence had collided with Reasor’s and it proved to be the final piece in the creative puzzle. Yuki was only six months old when the flood incident occurred, and it would be the just the first of many feline adventures and misadventures that became worth writing down. Reasor told me that the name Yuki means “snow” in Japanese. And, as she would later discover, “yukis” were also a type of Japanese destroyers used in the Japanese navy. Just as the meaning of the name Yuki went from the gentle image of falling snow to a destroyer ship so did the warm and cozy cuddles of a baby kitty quickly morph into a calculating cat. A look at Reasor’s background reveals that she was a theatre major with a strong emphasis in English literature. Additionally, she found time to work art classes into her course of study. That education and the mischievous fur ball named Yuki provided Reasor with everything she needed to bring forward a long harbored dream of becoming a comic strip artist. There was the flood, and then Yuki the Destroyer was born. Comic strips are a team effort. The process starts with Yuki of course, who provides the story line. Then Reasor draws and inks the images she needs with bold lines, a process that she prefers to do by hand. This initial drawing has a rough look. Enter team member Rusty Woods, whose title is Digital Editor. He takes Reasor’s drawing and “cleans” it. This means that he cleans up and smoothes out the lines and imperfections. You wind up with a basic drawing that looks like something in a coloring book. At this point he is working with pictures of the cats and the scenes, but not yet full panels. In Photoshop, Rusty will work with the background and cats separately before they get layered on top one another. The clean drawings of the cats and backgrounds go back to Reasor who puts all of it into the panels for the comic strip. Right now, it’s just black and white. Next it goes to Tom Boyles, who is known as The Letterer. Tom takes the script and puts it into word bubbles, so we know exactly what Yuki has to say or think about the latest bit of chaos she’s caused. Tom is also the I.T. guy, who maintains Yuki’s website, yukithedestroyer.com. The next person on the team is Mandi Johnson who adds color to all of the panels, making Yuki the Destroyer a bright and polished comic strip. Mandi’s job is called The Colorist. The final step is passing the now colored panels back to Tom who will add in the URL and Reasor a’s signature. The whole creation is a much more intricate process than one might think. It’s taken Reasor and her team about five years to bring Yuki, The Destroyer to publication. Although the cat can be found on the pages of the website, The Messenger will be the first newspaper to publish the series. And getting published is a dream come true for Reasor and the team. When I asked Reasor where she sees herself in another five years, she replied without hesitation. “I want to have a Yuki float in the Macy’s Thanksgiving Day parade.” She envisions Yuki being as recognizable as Hello Kitty one day. It’s worth mentioning that although Yuki is the master instigator, she does enjoy the company of other cats. Peanut is her sidekick and Ty, short for J. Tiberius Cute, is her little sister. Readers will note that Yuki never takes responsibility for her actions, and that her paw is usually pointed in the direction of Peanut or Ty. “I didn’t do that,” she says pointing at one of them. 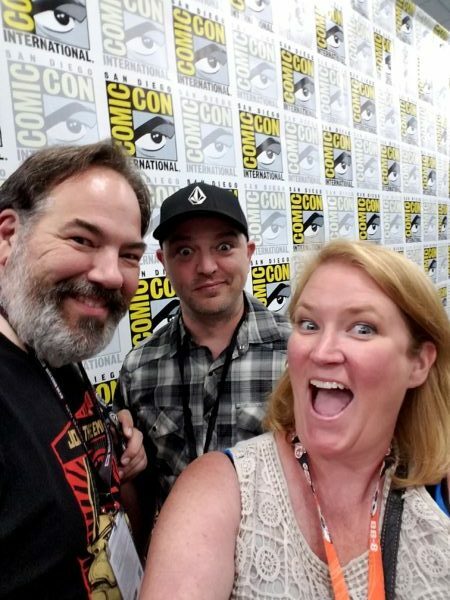 When Reasor and the team go to Comic Con, the big comic book convention in San Diego this year, they will have a lot to share about Yuki’s publication launch. Life happens, as John Lennon once said, when we’re busy making other plans. Who knew that a Yuki caused flood would be just the inspiration that Reasor needed to launch her dream of creating a comic strip? Yuki and Reasor’s story is the ultimate “when life gives you lemons, make lemonade” sagas. 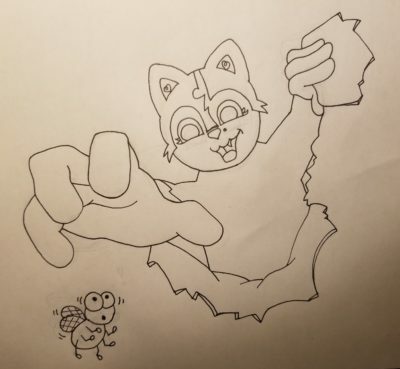 Reasor is now a published comic strip artist, and Yuki is the star of her own comic strip. And it wouldn’t surprise me at all to see Yuki floating above the Macy’s Thanksgiving Day parade one day in the near future. Stephanie Raffelock is an overly caffeinated, type-A personality, and novelist on the verge. A graduate of Naropa University’s program in Creative Writing and Poetics, Stephanie worked an internship at The Boulder Daily Camera and has penned articles for The Aspen Times, Quilters Magazine, Care2.com and Nexus Magazine. She currently writes a bi-monthly column for SixtyandMe.com, and is a regular contributor to The Rogue Valley Messenger. Find out more: on her website stephanieraffelock.com; on Facebook: @StephanieRaffelock; on Twitter: @Sraffelock. Way to go Team Yuki….all your hard work is paying off!! !